The car was at least 90 degrees inside and I couldn’t figure out how to turn it on. I was holding down the power button and pressing on the brake — but nothing. Maybe this was a bad idea. A week earlier, when my mom called to tell me she couldn’t find her driver’s license, I knew it would cause problems for our planned get-together in Boston. 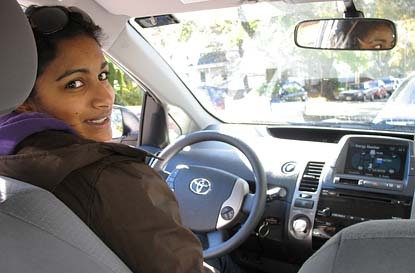 “But how are you going to rent a car?” I asked her. “We won’t be able to go anywhere without it.” She had no answers. 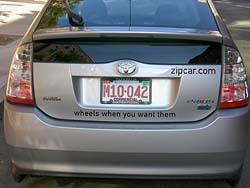 The program, I found, is called Zipcar, and lets students and faculty rent one of the two Toyota Priuses on campus for $7 per hour and $55 per day. Registration was relatively easy: I filled out a form online, and within hours found myself approved, with a brand new Zipcard to open the car. I quickly made the reservation and called my mom with the good news. In retrospect, that was the easy part. A few days later, I walked over to the Franklin Street lot at Bates, my arms laden with bags for my trip to Boston to meet my mom and sister. I took special care to stick the Zipcard, which was small and almost like a credit card, into my pocket, so I wouldn’t have to search for it among the various bags once I got there. Unfortunately, once I got there, the card was gone. Pockets? Nope. Bag? Nope. My bags and I even made the heavy trip back to my room to look there, but no dice. It just disappeared into thin air. Worried, I hurried over to the Student Activities Office to get another card, and called up the company to reactivate it. They were beyond helpful, even going out of their way to adjust the reservation for the time that I had wasted looking for the card. And now, here I was. Sitting in this hot car. With no idea how to start it. Frustrated, I pressed the power button again. Nothing. After a couple of minutes of wondering what to do, I looked down. Oh. Putting the key in the ignition would be a good start. Five minutes later, I was on my way. Driving a Prius is . . . a little bit of an adjustment. My shock at the first intersection was somewhat mitigated by the fact that I knew it would happen, but I was still startled when I felt the engine turn off. I turned up the volume on the radio to drown out the lack of sound. The Prius coasted more than my Camry does, and when you slow down and begin to hear the engine slow and shut off, it definitely gets your attention. For a car that took a lot of driving that day, though, it certainly held up. It withstood several trips to Logan airport and the Amtrak station to get my mother and sister, and then actually into the city more than once that weekend. Luckily, gas was included in the rental price. Driving it was actually pretty fun too. I tend to miss driving when I’m at Bates — turning up the radio and singing along like I would never do in public. There’s so few parking spots on campus, and it’s not feasible for me to bring my car all the way from California, so the Zipcar gives me the mobility that I missed my freshman year. I’ve been able to pile my friends into the car and go out to grab dinner at Da Vinci’s or run to Shaw’s to pick up groceries. The Zipcar gives me the freedom to take off and go without the expense of driving a car all the way out here, paying for a parking permit, gas and insurance. That definitely works for me. We hear a lot at Bates about having a sustainable campus, trying to reduce our energy consumption. I feel like I’ve found a way to do that without even making a real difference in my everyday life — I don’t need a car that often, and when I do, one’s easily available. The trip back up from Boston, other than my going a hundred miles the wrong way, was uneventful (I never said I was good with directions). Stopping to fill up only twice for a trip of well over 400 miles was incredible — the next car I’m buying is definitely a Prius. And I’m taking the Zipcar out again next Monday. I need to do some grocery shopping, and it’s so much easier than hopping on a bus.